Nicole Richie has designed three new pieces for her jewelry collection House of Harlow 1960. These new pieces are a modern twist on the old classics from House of Harlow 1960 the starburst necklace, the starburst cocktail ring and the stations necklace. The new pieces will be available from January and they all feature Abalone which is a type of decroative shell. Abalone makes fantastic jewelry as it has a mother of pearl effect. 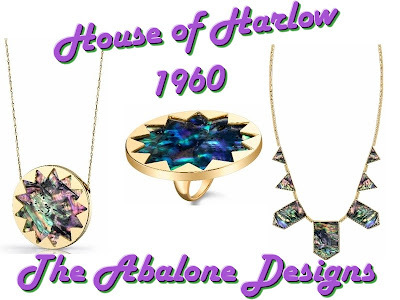 You can pre order the pretty Abalone House of Harlow 1960 pieces from shopthetrendboutique. it's not called the 'abalone' collection is it? It's actually 'poa' shell the abalone is the creature that lives in shell. Wonder if Nicole realises this? Nope it isn't called the 'abalone' collection. I just called it the 'Abalone designs' as on thetrendboutique site the pieces are all stated as featuring an 'iridescent abalone inlay'. I never knew it was actually called the poa shell, good spotting. I dont know alot about shells! Not too sure if the correct spelling is 'poa' but I only know as pacific islanders maoris etc eat abalone. My fiance does and have no idea how he eats it! lol eewww! It's actually commonly called paua (pronounced 'pou uh') shell in New Zealand (as this is the Maori name), whilst abalone is correct for the US, UK etc ;) I adore paua shell and can't wait to purchase some of these items!